Dr Ozs salad dressing is so simple to make and so delicious, youll never buy bottled dressing again! I promise. Okay, so heres the deal I have eaten more fat free salad dressings than I could possibly count many of them quite terrible, but some really good (the ones youll find on A Healthy Kitchen). Until quite recently, I have treated fat like my enemy, but this girl is trying to learn some new tricks for optimal health. Ive been watching Dr Oz, and I can tell you this Dr Oz is a BIG TIME proponent of having some extra virgin olive oil (EVOO) in your diet daily. In fact, Dr Oz recommends 1 to 2 tablespoons of EVOO daily as being optimal for your heart and overall health. Anyway, heres Dr. Ozs Balsamic Salad Dressing Recipe. Combine oil, vinegar, mustard, garlic and soy sauce; mix well. If you have a Magic Bullet (small blender), combine all ingredients and blend well. Since my Magic Bullet will grind peppercorns, I use 3 or 4 peppercorns in place of the ground pepper and blend it with the rest of the ingredients. If you blend it really well, it will not only be thick and creamy, it will hold its creaminess in the fridge (if you have leftovers or make a larger batch). This only takes a couple of minutes to make and its restaurant quality delicious! Note: Photo was taken with Simply Divine Vine Salad topped with Seasoned Baked Cod. 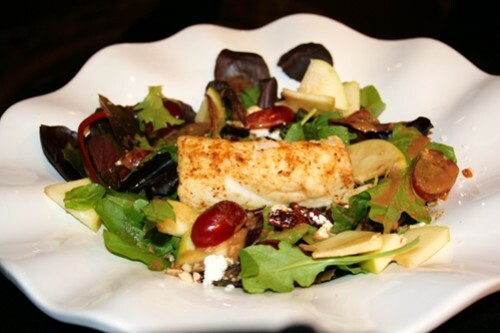 12 Comments on "Dr. Ozs Creamy Balsamic Salad Dressing"
Balsamic salad dressings are very popular on restaurant menus because of their sweet, mild flavor. So delicious and easy to whisk together, this balsamic salad dressing should be a regular in your dressing recipe repertoire.Combine all ingredients, except oil, in a mixing bowl. Whisk vigorously while very slowly drizzling in the oil. Season with salt and fresh ground black pepper to taste. May be refrigerated overnight for even better results. Stir before serving. May be stored for several weeks in the refrigerator. Beautiful blog with helpful content! This recipe looks yummy. I am a huge fan of olive oil and am in love with Garlic Gold. Good job you are trying to get over your fat phobia as you know it is a good fat! I am following noe and will check back in soon. Hi Shane, Thanks for your gracious feedback. I just discovered your blog the other day when I was reading up on HFCS and WOW your passionate, knowledge-based blog blew me away. Im a HUGE fan now and will be back often! Thanks for visiting aHealthyKitchen. I hope you will come back often as Im sharing the growth path that Im on. Excellent blog. I’ll put your link on my blog. Great work! Very good dressing. I added a teaspoon of pesto. Interesting addition Andy. I like the idea! Excellent recipe For those who want to lower blood pressure, it is beneficial to replace half of EVOO with pomegranate juice. So it becomes pomegranate balsamic dressing. Might need a bit of brown sugar in it to be perfect after this replacement. Definitley looks good and simple to make. I like the easy ingredients needed. Anyone know of a salad dressing with evoo, lemon juice (or vinegar), honey mustard, and NO SOY ? I knowingly eat no soy, which difficult to do as soy is in PRACTICALLY EVERYTHING. Id rather have a bottled dressing but if there isnt one out there I can use a recipe.